"When Convoys Wharf has been redeveloped, the history of the King's Yard and its Tudor remains will lie in a shallow grave underneath shiny apartment blocks and cappuccino bars. Professionals will move into the residential towers, which will probably be named after Drake's Golden Hinde. And when their dinner party guests ask them where the docks used to be, they will reply: 'I don't know.' "
5 MARCH 2014 London Assembly challenges Boris on his power to call-in planning applications. The Chair, Darren Johnson said "The recent acceleration in the number and speed with which the Mayor is taking over planning decisions from boroughs...puts developers and investors before local democracy". The Assembly's motion listed 11 applications – including Convoys Wharf –- and said that on many decisions, the Mayor has ignored legitimate borough concerns about issues such as inappropriate density and very low targets for affordable housing. FEBRUARY 2014 University College London pledges to return the Tudor Royal Dockyard foundation stone to Deptford, the result of research by the owners of the Master Shipwrights' House. CHRISTMAS 2014 The Section 106 agreement still not signed because the developer cannot agree terms for a financial review mechanism on affordable housing. NOVEMBER 2014 Channel 4 expose Boris Johnson's biased handling of £1b deal favouring Chinese developers of historic Royal Albert Dock. OCTOBER 2014 Lenox Project and Sayes Court Garden projects continue to meet with GLA planners. The Section 106 agreement that incorporates the projects has now missed three deadlines. Boris turns down Lenox Project's request to include the Double Dry Dock in the feasibility study which determines the site of the project. He claims the dock 'no longer constitutes a functional piece of civil engineering'. This is unsubstantiated by the Museum of London's archaeological investigations which revealed the structure to be in very good condition. The GLA's negotiations are biased in favour of the developer. SEPTEMBER 2014 The massive success of Greenwich Tall Ships Festival demonstrates the enormous potential of the Lenox Project at Deptford. 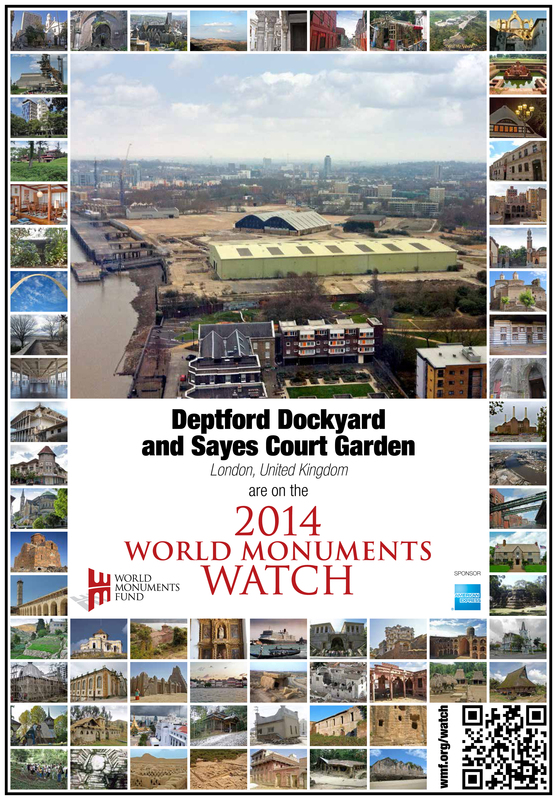 OCTOBER 2013 Only days after Deptford Is Forever made their way up Deptford High Street in a procession with Laura X Carlé's giant cardboard anchor, the World Monument Fund announced its new Watch List of world heritage sites in danger, which includes Venice and Syria. “There are world famous naval dockyards right across Britain. Some of the finest museums in Europe can be visited in Portsmouth, Chatham and elsewhere, yet the place where it all began, where our maritime destiny took shape, is forgotten, and tragically ignored by the very city it did so much to shape. Deptford is where the Tudors decided to build naval ships to protect their ill-gotten kingdom from other invaders like themselves, and then to exploit the explosion in maritime activity that came with the discovery of sea routes to Asia and the Americas. 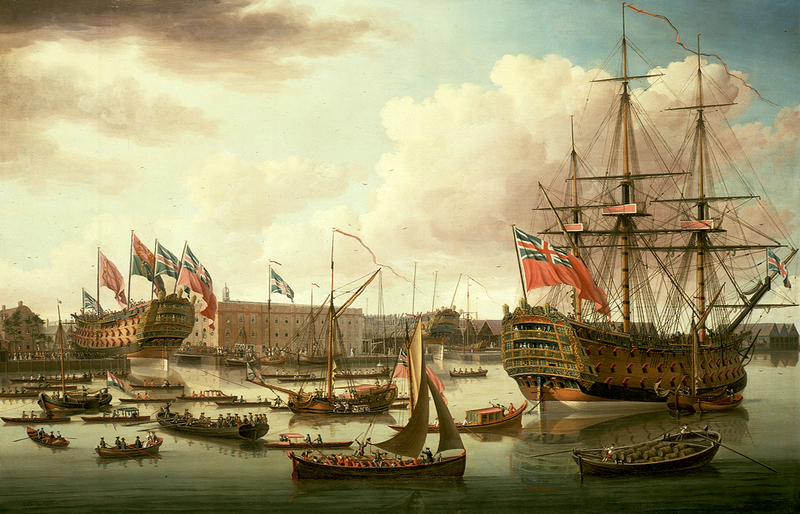 Deptford is ground zero for the Royal Navy. "The Lenox Project reconnects Londoners and all of us with a vitally important piece of our heritage. London grew rich because it was a port. Ships built at Deptford protected the trade on which London depended, and forged links between the growing city and the rest of the world. Today London is one of the earth’s most dynamic, outward looking, multi-cultural cities. That story starts at Deptford. "This project is not just about preserving heritage. It is about creating the kind of international profile and draw that is impossible to replicate anywhere else. A block of flats, a nice looking office block is anonymous. They can be built from Shanghai to Seattle. Building a 17th century warship, on the site of one of the world’s greatest dockyards, a short distance from the beating heart of an international city, that is unique. The multiplier effect of interested people, scholars and tourists would be a major boon to the area, the city and the country. 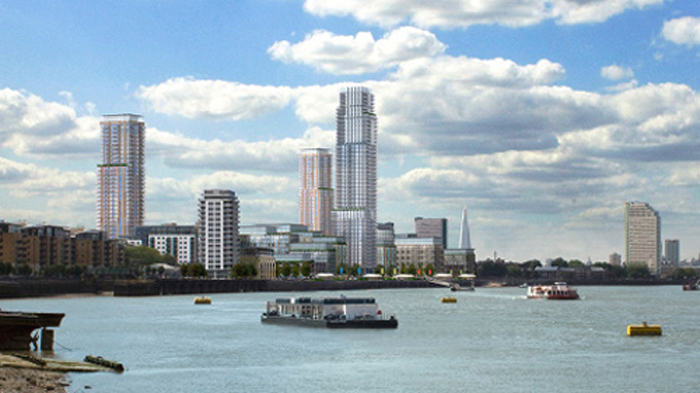 "..let's stop for a minute before anyone decides that somehow giving local people access to the river by sticking huge residential towers on their doorstep is regeneration, or that somehow or other they will benefit or be grateful. This is pure real estate development, and represents everything that is wrong with our property industry. "What Deptford needs is not more high-density housing in an area of existing high density, putting more pressure on existing infrastructure. What's needed is more open space, freedom to enjoy access to the river, and new employment opportunities that go way beyond construction." 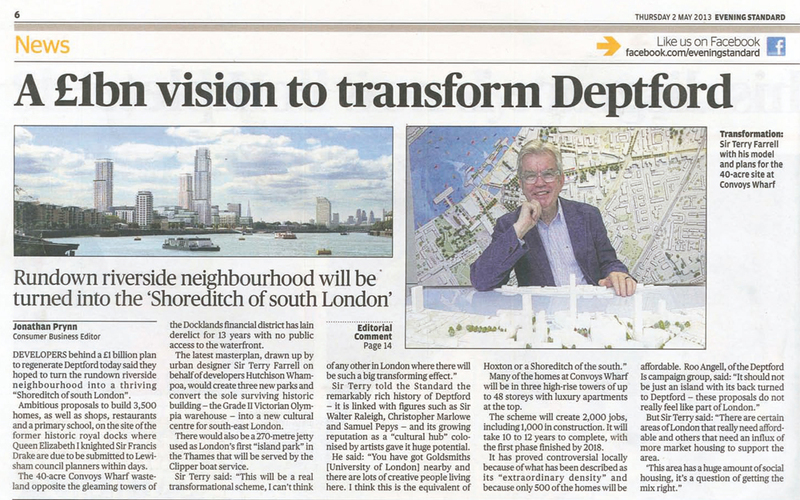 "This will be a real transformational scheme, I can't think of any other in London where there will be such a big transforming effect...the remarkable rich history of Deptford and its growing reputation as a 'cultural hub' colonised by artists give it huge potential...there are lots of creative people living here. I think this is the equivalent of Hoxton or a Shoreditch of the south." Tagged onto the Hutchison Whampoa application for Convoys Wharf is a "Cultural Strategy" that reads like an estate agent's brochure. "Deptford has a strong creative community whose vibrancy can be amplified by successful development at Convoys Wharf, establishing Deptford as a new creative district for London..."
SEPTEMBER 2013 A third masterplan is submitted to Lewisham Council by Hutchison Whampoa and their architects Farrells. 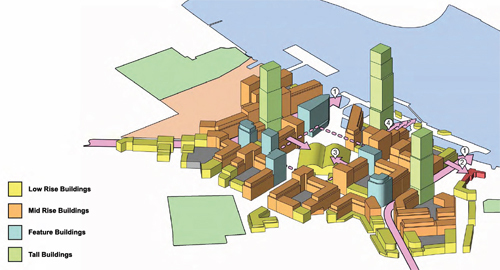 Outline planning permission for the development which includes residential towers to the heights of 48, 38 and 38 storeys was to be discussed by the Planning Committee in November 2013, to be decided in February 2014. But the application was 'called in' by Boris Johnson and the GLA Planners in October 2103. 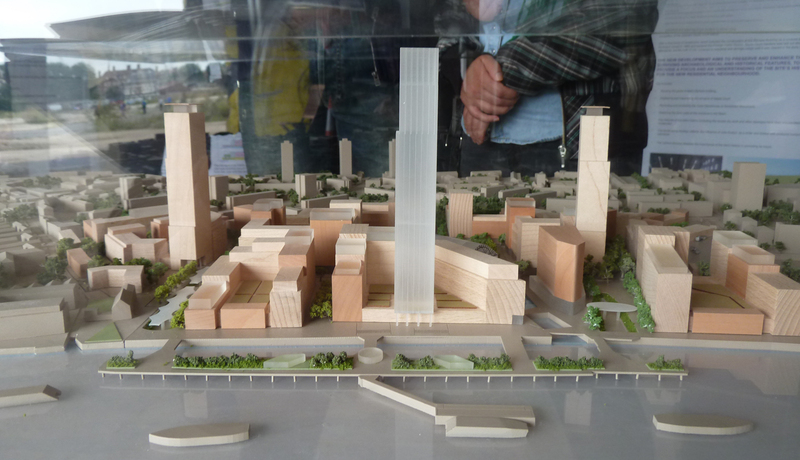 Hutchison Whampoa's plans for the site are totally unsuitable for the regeneration of Deptford; the height and density of the buildings is out of scale with the environs, and with a predicted 10,000 new residents there will be severe impacts on local infrastructure – particularly on roads and public transport – with plans to house 1800 cars, and only one tiny primary school and a doctors' surgery that will double as a community facility, and very little open space. They claim to be opening up the site to join Deptford High Street, but this is only because the transport links are so poor, new residents will have to use Deptford station. Affordable housing is less than 14%. "The fundamental problem is the developers’ determination to create 3,500 new homes on a site 10km from the centre of London that lacks a tube stop. That is a particular problem given how few of this luxury riverside development’s 9,000 residents will be employed close to home. Deptford is, after all, one of the poorest wards in one of the poorest boroughs in London. "Quite what the development gives back to the community is also hard to fathom. Once an area providing local employment, it is to be replaced by a dormitory village that lacks the transport network to support it. Instead, what’s needed is a development that recognises the obligations it owes the community." 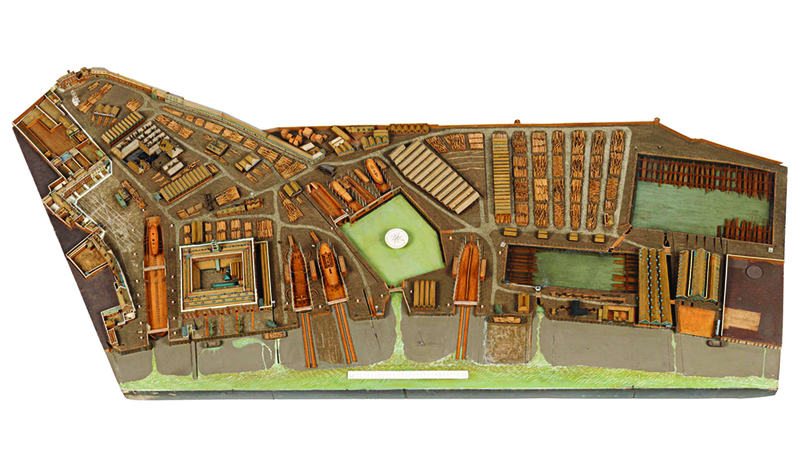 In 1513, King Henry VIII established the King's Yard at Deptford to build ships for the Royal Navy. For four hundred years Deptford was the central power house of the nation's navy, and hundreds of warships and countless trading vessels were built here, including ships built for exploration, science and empire, such as The Golden Hind. Other famous vessels such as the Mary Rose, Discovery and Endeavour were refitted here. The yard was closed down in 1869, although a navy ship remained in a slip and the adjacent Victualling Yard (now part of Pepys Estate) but remained in Navy hands for another 100 years. 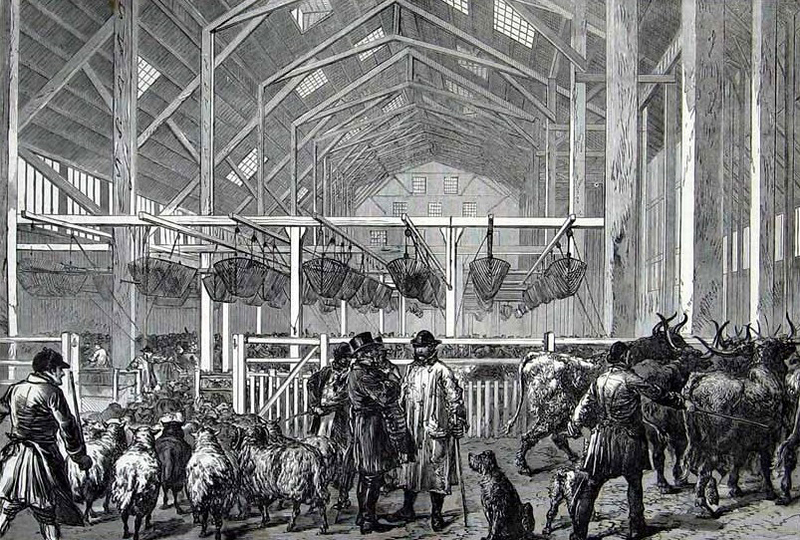 The yard became known as Convoys Wharf and housed a Foreign Cattle Market until 1913. Above ground the survivors are The Master Shipwright's House and the Olympia Shed, which are listed structures. The dockyard still exists, and many of its major features still survive below ground level, such a dry dock, five slipways, mastponds and a basin. 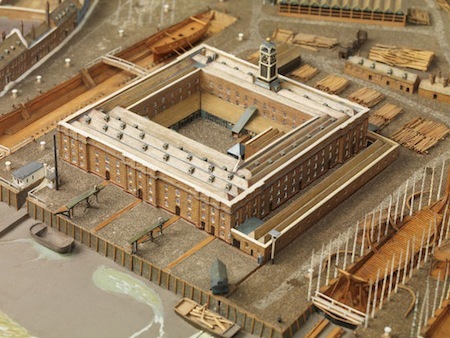 The Great Storehouse, originally built in 1513 and added to during the life of the dockyard, survived World War II, but was demolished in 1990 by Rupert Murdoch's News International who bought the site from the MoD in 1980. Murdoch also sold off the Master Shipwright's House, which has since been restored by the private owners. Campaigners saved the dockyard clocktower (part of the Great Storehouse) but the GLC moved it to Thamesmead to adorn a new shopping centre. 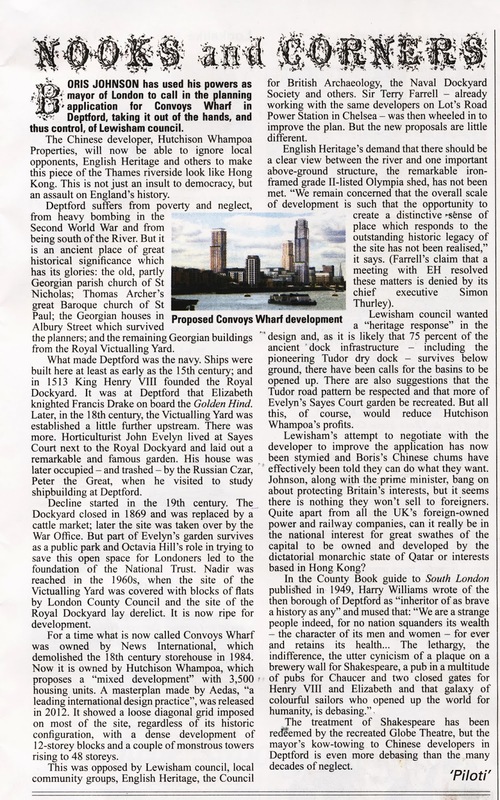 The GLC promised the campaigners that it would be returned to Deptford if a place could be found for it. This has never happened. Murdoch moved his newsprint storage elsewhere in 2000 and started planning redevelopment of the Convoys site, with an application in 2002 to build up to 3500 luxury homes. Locals campaigned vociferously against it and, as Convoys Opportunity, presented instead viable plans for a cruise liner terminal in order to bring employment to the area. Lewisham Council who took over the planning authority from Greenwich Council approved the News International plan in outline in 2005 – at a time when the GLC's target for social and affordable housing was 50%. Murdoch then sold the site to Chinese conglomerate Hutchison Whampoa and Cheung Kong Holdings, both of which are owned by the 17th richest billionaire in the world, Li Ka Shing. Murdoch still has a profit share in the enterprise. "English Heritage remains concerned that the overall scale of the development is such that the opportunity create a distinctive sense of place which responds to local character and provides an appropriate setting for designated and undesignated heritage assets, is lost." SEPTEMBER 2013 Press Conference at the Master Shipwright's House chaired by BBC TV's Horrible Histories Ben Willbond, as part of London Open House. 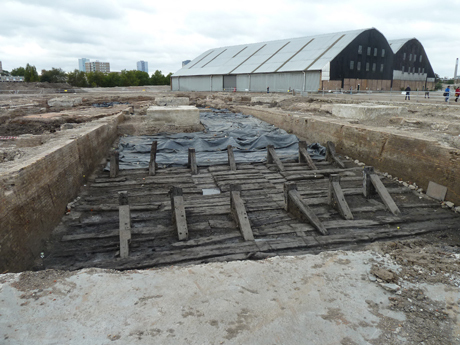 The developer opened up the Dockyard site and we discovered the Deptford anchor inside the Olympia Shed. 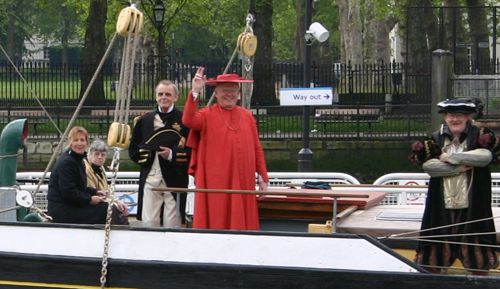 Local activist Bill Ellson, dressed as Henry VIII, posed with the hidden anchor.